The above proclamation was part of a short speech made by Oakland’s Rickey Henderson just moments after he stole base number 939 in his career. The thievery of third base in the bottom of the fourth inning in a game against the New York Yankees on May 1, 1991, moved Henderson to number one all-time on the stolen base leader board. To some, his statement may have seemed boastful, disrespectful, or just plain out of line. But the truth stands alone, and the truth is that Rickey Henderson is the greatest base stealer of all time. Henderson had been caught stealing by New York catcher Matt Nokes in the first inning of the May showdown. Henderson took note of Nokes’ exuberance at his success. Soon-to-be-second-place Lou Brock had been traveling with the A’s so he could be present when Henderson set the new record. Henderson was in his hometown of Oakland, with his mother in attendance. If he needed extra incentive to run into the record books, Nokes may have provided it. 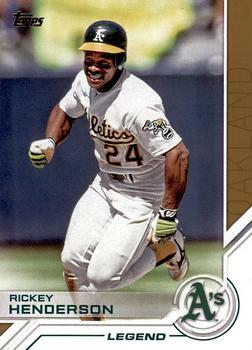 Rickey Henderson was born Rickey Nelson Henley on December 25, 1958, in Chicago. He was the second son (after older brother Tyrone), born to John and Bobbie Henley. John Henley left the family two years after Rickey was born. Bobbie gathered up her family (in addition to Tyrone and Rickey, there were brothers Alton, John, and Douglas) and moved them to her native Arkansas and settling on her mother’s farm in Pine Bluff. It was also in high school where Henderson met his future wife, the former Pamela Palmer. They had three daughters: Angela, Adrianna, and Alexis. He opened the 1979 season at Ogden of the Class AAA Pacific Coast League. After 71 games, Henderson was called up to Oakland and made his major league debut on June 24, 1979. He went 2-for-4 against Texas with a double and a stolen base. Henderson led the team with 33 steals and batted .274. The Athletics were a dismal team that year. Their record was 54-108 and they finished 34 games behind California in the American League West Division in 1979. That all changed when manager Jim Marshall was shown the door and Billy Martin took over. Martin could turn around a club’s fortunes as well as anyone and he did so in Oakland. Remarkably, the Athletics’ record improved to 83-79 as they finished in second place, 14 games behind Kansas City’s juggernaut in 1980. Martin preached playing aggressively, or “Billy Ball,” as it was commonly referred to. This style suited his team just fine. Henderson also improved, finishing second in the league in walks (117), third in on-base percentage (.420), and he batted .303. He was selected to participate in the first of ten All-Star Games. 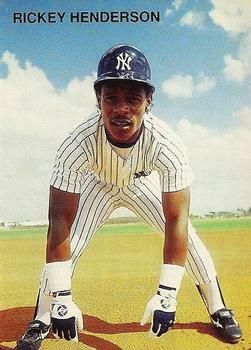 Henderson was also the recipient of his first and only Gold Glove Award in 1981. Henderson led the league in stolen bases with 100 thefts, beginning his dominance of that category, and his assault on the record books. He accomplished the feat two more times in his career: 1982 (130) and 1983 (108). Henderson led the AL in base thievery the next seven straight seasons and eight-of-nine years. He became the first player, and as of 2017 the only player, in American League history to steal 100 bases in a season. Henderson had a slightly different theory regarding stealing bases. While most players would study a pitcher's pickoff move to first base, Henderson paid attention to the pitcher's move to home plate. He believed that if he could accurately detect when the pitcher was going home with the pitch, he would be able to get more of a jump on his way to stealing a base. The 1981 season was broken into two halves due to the players’ strike. Henderson led the league in runs (89) and hits (135) as well stolen bases (56). “Rickey is a once-in-a-lifetime player,” said Martin. “You see very few Rickey Hendersons. You might not see another one for fifty years.”10 The pitching staff was sublime. Rick Langford (12-10, 2.99 ERA), Steve McCatty (14-7, 2.33), Mike Norris (12-9, 3.75) and Matt Keough 10-6, 3.40) anchored a formidable staff. The A’s won the West in 1981 and defeated Kansas City in the Division Series. But they were swept by the Yankees in the ALCS. Still, the transformation from just two years prior was remarkable. Martin was fired after the season, but resurfaced in New York as manager of the Yankees. The Athletics predictably did not improve under his replacement, Steve Boros, and then Jackie Moore. For Henderson, he was a showman out on the field. He made snap catches with his glove, pranced around the bases, beat his chest, and was noted as a hot dog. But he felt the fans were paying to see him play, so they should be entertained. On August 30, 1985, the Yankees trailed Toronto by five games in the AL East. The Yankees won 11 straight from August 31 through September 10. They closed the gap to 1 ½ games. But then the bottom fell out and they posted a 3-10 record from September 11 to September 24. Even though they closed out the season on a run of 10-3, they could not catch the Blue Jays, who claimed the division title by two games. In 1986, they fell short again, finishing in second place to Boston by 5 ½ games. The A’s were the defending American League champs, but lost to the Los Angeles Dodgers in the World Series in 1988. As Henderson said when he was dealt to New York, the Athletics were looking to build a team of power hitters. And they did just that. In 1988, Jose Canseco led the AL in round-trippers with 42. Mark McGwire added 32 and Dave Henderson smacked 24. Canseco and McGwire, known as the “Bash Brothers”, formed a formidable pair in the middle of the A’s lineup, along with Dave Henderson and Carney Lansford. Now they added Rickey Henderson to the top of the lineup and they were unstoppable. Henderson made two trips to the disabled list in 1992, as did Bob Welch, Scott Brosius, and Dave Henderson. In spite of the injuries, the A’s won the AL West by six games over the Twins. However, they were dumped in six games by Toronto in the ALCS. On July 5, 1993, Oakland hosted Cleveland in a doubleheader. Henderson led off both games with a home run. It was believed that Henderson was the first player in 80 years to accomplish the feat. Harry Hooper of Boston turned the trick on May 30, 1913, against Washington. 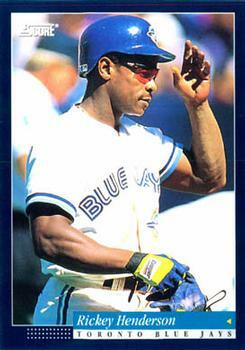 Henderson was dealt to Toronto on July 31, 1993, for pitcher Steve Karsay and a player-to-named-later who turned out to be outfielder Jose Herrera. It was a tale of two teams, as the A’s were rebuilding and were in the cellar in the AL West. Toronto was tied with New York atop the AL East at the time of the deal. Henderson stole 22 bases in 44 games for the Blue Jays. Toronto finished on top in the East and eliminated Chicago in six games of the ALCS. In the World Series, the Jays made it two World Championships in a row as they toppled Philadelphia in six games in the World Series. Henderson returned to Oakland in 1994 for his third tour of duty with the A’s. He signed a two-year $8.6 million-dollar contact. In spite of some differences that he had with La Russa, Henderson returned to the familiar surroundings of his home. The season was cut short by the players’ strike on August 12, 1994, forcing the cancellation of the remainder of the season and for the first time since 1904, the postseason. Each league was now split into three separate divisions. Oakland finished a scant one game behind Texas in 1994. The strike extended into the 1995 season, wiping out the first three weeks. Henderson batted .300 and swiped 32 bases in 112 games. But the Athletics finished in last place with a 67-77 record, 11 ½ games behind division-winner Seattle. He may have been a great teammate, but his production slipped. Henderson batted .241 and the following year, he was traded to the Anaheim Angels on August 13, 1997. For the 1998 season, Henderson signed a one-year deal with Oakland, the fourth time he suited up for the Athletics. At 39 years of age, Henderson led the AL in stolen bases (66) and walks (118) in 1998 despite a .236 average in 542 at-bats. The New York Mets inked Henderson to a two-year deal worth $3.9 million after he 1998 season wrapped. He was named The Sporting News Comeback Player of the Year in 1999. He batted .315 with 37 stolen bases, 12 home runs, 42 RBIs, and a .423 on-base percentage. The next year, he was released by the Mets on May 13, 2000. Tempers were hot from the year before when it was reported that during the Mets’ Game Six loss to Atlanta in the LCS, he was playing cards in the clubhouse with Bobby Bonilla. Henderson denied the allegation and demanded that the accuser confront him face-to-face. Of course, it never came to that. He reported late to spring training the following season. “It’s addition by subtraction,” said Mets general manager Steve Phillips.22 Henderson signed with Seattle and finished out the year with the Mariners. Rickey returned to the Padres in 2001, which proved to be a record-setting one for Henderson. On April 25, 2001, the Padres were trailing Philadelphia, 5-3, heading into the bottom of the ninth inning. Henderson led off with a walk against Phillies closer Jose Mesa. The free pass was the 2,063rd of Henderson’s career, surpassing Babe Ruth for the top spot on the all-time walk list. On October 4, 2001, Henderson hit a home run off Dodger pitcher Luke Prokopec in the third inning. As he neared home plate, Henderson slid into home plate to commemorate the 2,246th run scored in his career, passing Ty Cobb on the all-time runs scored list. “When I first started in the big leagues,” said Henderson, “I felt that as the leadoff hitter, my job was to get on the base paths, create stuff, and score some runs to help my teammates win some ballgames. It just happens over the 23 years I think I went out there and did my job as well as I could do … and all of a sudden, it’s a record breaker … it’s just an honor. Boston signed Henderson to a minor league contract in 2002. To this point in his career, Henderson had stolen 1,395 bases, totaling more than the Red Sox franchise, which in the same amount of time, had amassed 1,382 stolen bases.25 The Red Sox passed Henderson early that year. Indeed, that opportunity came his way, as Rickey signed on with the Los Angeles Dodgers on July 14, 2003. He played 30 games, batting .208. That was the last season in the major leagues for Henderson. He ranks first all-time in stolen bases (1,406), runs (2,295), and leadoff home runs (81). Henderson ranks second all-time in walks (2,190). For his career, he smacked 297 home runs, drove in 1,115 RBIs, and batted .279. In retirement, Rickey was a special instructor for the Mets in spring training, and served as their first base coach in 2007. Rickey Henderson was inducted into the National Baseball Hall of Fame in 2009. On August 1 that year, Henderson’s number 24 was retired by the Athletics. This biography was reviewed by Joel Barnhart and fact-checked by Jeff Findley. 17 Malcolm Moran, “Dazzling, Daring A’s Win Crown,” New York Times, October 9, 1989: C6. 19 Michael Martinez, “Henderson Selected Most Valuable Player,” New York Times, November 21, 1990: B13. 20 Tom Barnidge, “A’s Frantically Dial Canseco Hotline During Series But Jose Doesn’t Answer,” The Sporting News, October 29, 1990: 5. 21 Tom Weir, “Inside Rickey’s World,” USA Today, September 25, 2001: 2C. 22 Liz Robbins, “With Patience Long Gone, Mets Release Henderson,” New York Times, May 14, 2000, SP5. 23 Paul Gutierrez, “Record Run for Rickey,” Los Angeles Times, October 5, 2001: B10. 24 Bernie Wilson, “Rickey Register’s 3,000,” usatoday.com & baseballweekly.com, October 8, 2001, accessed November 6, 2017. 26 Tom Verducci, ”What is Rickey Henderson Doing in Newark?”, Sports Illustrated, June 23, 2003: 80. 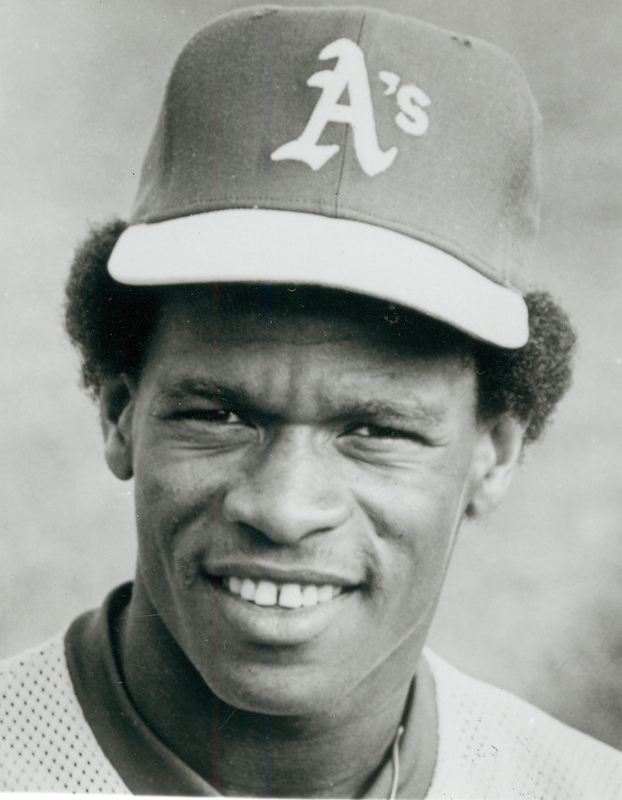 27 Jon Becker, “A’s to unveil statue of Rickey Henderson at Coliseum next season,” San Jose Mercury-News, September 15, 2017,	accessed at http://www.mercurynews.com/2017/09/15/report-as-to-have-statue-of-rickey... on November 7, 2017.